Le Vieux Donjon is a fairly new winery. Especially if you use European standards. Vieux Donjon was formed in 1966 by Marcel Michel. Prior to that date, their harvest was sold in bulk to negociants. Since 1979, Vieux Donjon has been managed by Lucien Michel and Marie Michel. Following in the footsteps of their families young tradition, their daughter Claire Michel, (who is now Claire Fabre, as she changed her name when she married Adrien Fabre of Domaine la Florane and Domaines de l’Echevin), manages Vieux Donjon along with her brother François Michel. Claire Fabre, like many young winemakers all over the world, learn their part of the wine making trade by working as an intern at a different winery. That tradition often takes place with the aspiring intern moving to another country for a period of time. Claire Fabre worked as an intern at one of the top wineries in Napa California, Harlan Estate to learn more about the wine trade. So, when you meet her, do not be surprised about her love of Cabernet Sauvignon and other wines from California and the Napa Valley! Since taking over, the brother and sister team has slowly modernized the estate. In 2013 they inaugurated a new tasting room as well as updated the entire winery. The 18 hectare Southern Rhone vineyard of Vieux Donjon is divided as follows. 17 hectares of vines are devoted to the production of red Chateauneuf du Pape wine grapes. 1 hectare of vines is used for white wine grapes. The best parts of the Vieux Donjon vineyards are planted to old vine Grenache. Many of those vines are close to 100 years old. In fact, more than 33% of their vines are more than 100 years of age! They have vines placed in different parts of the Chateauneuf du Pape appellation in the Le Pied Long, Bois de Boursan, Le Mourre de Gaud, Champigne and Cabrieres lieux-dits. They also own vines planted in sandy soils not too far from Chateau Rayas. As you can see from their vineyards, Vieux Donjon is not far from Cabrieres and Mont Redon. Le Vieux Donjon is an organically farmed, traditional style of Chateauneuf du Pape that ages well and sells for a fair price. Vieux Donjon is mostly traditional in their wine making as they only partially destem the grapes, a practice they began in 1993. Vieux Donjon is another important estate that does not produce a special high-end wine. With all their old vines, this is something they could easily do, but they chose not to, as they think it will harm the blend for their main wine. Philippe Cambie works as the consultant. The best vintages of Le Vieux Donjon are: 2018, 2017, 2016, 2015, 2012, 2010, 2009, 2007, 2005, 2001, 2000, 1998 and 1990. Le Vieux Donjon produces 2 Chateauneuf du Pape wines, a Chateauneuf du Pape Rouge and a white Chateauneuf du Pape wine. However, a special cuvee was produced by Vieux Donjon in 1990 and 1998. This was limited to between 25 and 100 cases. The bottles display a gold sticker that is marked; “Vieux Donjon Cuvee Especiale”. Le Vieux Donjon Rouge is usually a blend of 75% Grenache, 10% Mourvedre, 10% Syrah and 5% Cinsault, along with various other grape varieties added in small amounts. On average, the vines are more than 50 years of age, with many of the vines being older than 100 years. The grapes are destemmed to various percentages, depending on the vintage. During fermentation at Vieux Donjon, all the grape varieties are vinified together, with the exception of the Mourvedre. The winemaking here is traditional. Vinification takes place in traditional, square shaped, red concrete vats and aged for 18 months in a combination of 80% foudres and the remaining 20% is aged in cement vats before bottling. The production is close to 4,200 cases per vintage. Le Vieux Donjon Blanc which made its debut in 1993, is made from 50% Roussanne and 50% Clairette. The wine is completely aged in stainless steel tanks for 6 months. With only 1 hectare of vines, the production is quite small, on average, they produce about 300 cases of wine per vintage. Le Vieux Donjon can be enjoyed on the young side. However, it is better for young vintages to be decanted for 1-2 hours. This allows the wine to soften and open its perfume. Older vintages might need very little decanting, just enough to remove the sediment. Le Vieux Donjon is usually better with 4-5 years of bottle age. Of course that can vary slightly, depending on the vintage. In the best vintages the wine should be consumed within 5-20 years after the vintage. Le Vieux Donjon is best served at 15.5 degrees Celsius, 60 degrees Fahrenheit. The cool, almost cellar temperature gives the wine more freshness and lift. Vieux Donjon is best served with all types of classic meat dishes, veal, pork, beef, lamb, duck, game, roast chicken, roasted, braised, stewed dishes, barbecue, sausage, cassoulet and cheese. Vieux Donjon is also good with Asian dishes, hearty fish courses like tuna, mushrooms pasta, eggplant and tomatoes. The white wine of Vieux Donjon is best served with a myriad of different seafood dishes, shellfish, crab, lobster, sushi, sashimi, chicken, pork and veal, as well as Asian cuisine. 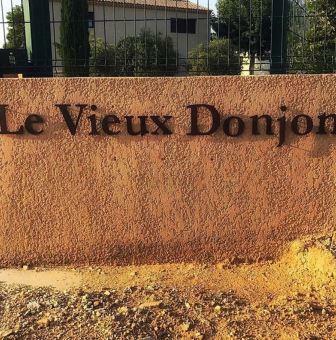 Le Vieux Donjon also produces wine from vines they own outside of Chateauneuf du Pape in the Minervois and Languedoc Roussillon appellations. Garrigue, thyme and oceanic notes create the nose, before you begin getting into the ripe, peppery, red fruits. On the palate the wine is rich, lush, long and sings with a real depth of flavor that holds on through the long finish. Give it a few years in the cellar and it promises to be even better. The wine was made from a blend of 75% Grenache, 10% Mourvedre, 10% Syrah and 5% Cinsault. Forward, medium bodied, earthy, cherry filled wine with kirsch, flowers and raspberry notes. Open, soft and if you like young Grenache, drinkable today, else give it 3-5 years. Roses, kirsch and spice create the nose. The wine is fresh, supple and invigorating with its peppery, kirsch and spicy blackberry essence. The wine was made from a blend of 75% Grenache, 10% Mourvedre, 10% Syrah and 5% Cinsault. Blackberry, licorice, truffle and black raspberry scents emerge with little effort. In the mouth, the wine is lush, round and concentrated. With tannins and structure to age, give it a few years before popping a bottle. Surprisingly forward and open, as the wine is often late in offering pleasure, the combination of kirsch, black raspberry, pepper and garrigue scents paired with luscious, ripe, sweet, peppery, fruits made this quite nice indeed. Much better than my previous bottle from the same case, this was rockin'! With loads of sweet, ripe, juicy, peppery, red berries, the wine offers richness on the palate and a peppery, garrigue, kirsch and black raspberry complexity on the nose. Splash decanted, this was a treat the moment it made its way from my glass to my palate. This seems to have changed since the last time, I recall tasting it. There is a pronounced fig, and jam note in the otherwise, delightful perfume. But those over ripe notes take away from the truffle, earth, garrigue, wet earth and hard to find, dark cherry fruits. Fat, round and not exactly low in acid, but lacking the freshness I want. If you are sitting on any my instincts is to finish them sooner than later. Enticing aromas of earth, black pepper, plums, kirsch and fresh herbs get you going. The wine is rich, soft, sweet, lusty and open for business. Deep in color, the wine required coaxing to bring out its licorice, pepper, garrigue, cherry and black raspberry scents. Rich, fat and concentrated, this rich Chateauneuf du Pape ends with a long, spicy, kirsch filled finish. Medium bodied, traditionally styled Chateauneuf du Pape showing kirsch, earth and spice characteristics. This is already starting to show well. Powerful, fresh, long, ripe, structured and tannic, this is now out of its shell and displays its wealth of ripe red fruit, black pepper, herbs and spice. Good now, this could even be better with more age. Ready to go, medium bodied, with a fresh, kirsch, spice and garrigue nose, there is a lot of freshness in the sweet, ripe, spicy, peppery, red berry finish. If barnyard is not your thing, you came to the wrong place as this wine is loaded with barnyard stink. On top of that you find, garrigue, pepper, kirsch, lavender and wild strawberry notes. Full bodied, with a gentleness to the texture, there is an appealing rustic charm to the fresh, spicy, red fruits in the. At 15 years of age, this is in the sweet spot. Winner, winner, winner, chicken dinner here! The nose explodes with its earthy, barnyard, kirsch, tobacco and licorice personality. The wine is rich, full bodied, concentrated, lush and packed with sweet, juicy fruit. Drinking at perfection, if you have a bottle, pop a cork. Kirsch, garrigue, earth, jam, pepper and raspberry aromatics mesh well with the concentrated, deep, ripe flavors, supple textures and long, fresh, spicy, black cherry finish. This is drinking great today and it should remain at this level for at least another 5-10 years. I love hitting wines in the sweet spot. Looking slightly older than its true age, the wine pops with kirsch, garrigue, spice box, earth, sea water, (but in a good, briney way) with a bit of licorice in the end of the bouquet. Luscious, fresh textures with a lingering, sweet, pure kirsch note in the finish. There is no reason to wait any longer to pop a cork on this beauty. Do not decant, this is really ready to go. Pepper, jammy black cherries, licorice and garrigue add to the aromatics. Soft, smooth and round in the mouth, the wine ends with spicy, sweet cherries. This is drinking in the perfect sweet spot, there is no reason to hold off popping a cork. Jammy blackberry, pepper, kirsch. Provencal herbs, lavender and earthy scents permeate the your senses. Full bodied, luscious, fresh, peppery black cherry liqueur flavors fill your mouth. This Chateauneuf du Pape is drinking perfectly. If you're looking for pleasure and a good time, this wine is up to the task. This beauty is drinking right where you want it to be. The ripe, sweet, fresh, peppery fruit is all there, with its earth, kirsch and garrigue profile. The wine is richly textured, full bodied, long, fresh and clean, leaving you with a trail of sweet, lush fruits in the end note. At close to 18 years of age, there is no reason to hold off any longer. The wine was produced from a blend of 75% Grenache, 10% Syrah, 10% Mourvedre and the remaining 5% comes from various, assorted varietals. Dense, big, meaty wine. Pepper, jammy black fruit, and fresh herbs. Very concentrated with a chewy texture and lots of red and black peppery fruit.